I had a bit of fun with this portion of my editing. I can't guarantee it's usefullness, but it was interesting as an overall picture. I like to write all in one document using Microsoft Word. Yep, I know there are lots of ‘novel writing' programs out there, but almost all of them split the book up into scenes, and for some reason this makes it too hard for me to see the big picture. To keep track of scenes, I give each one a title/header that sums up the action or main point of the scene (to be deleted before the novel is published), and use Word's index/contents feature, accessed through the navigation pane (in Word 2010). This lets me see the titles of all my scenes, and easily jump from one to the other. This works really well to give me the overall story, but then I wanted to get an idea of each scene, where it fit into the bigger picture, and whether it was consistent within itself. To do this I used a table to write the scene name, the POV character, and the number of words in the scene. As I worked through this, a few patterns started to emerge. I could easily see that while each scene had it's core point, each chapter did too. I'd been sort of grouping scenes into chapters as it felt right, so it was really great to see a pattern emerging. Once I had all these numbers, I plugged them into Excel for a little analysing. 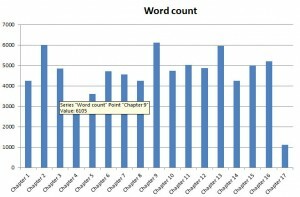 First, I looked at the word counts of the chapters. 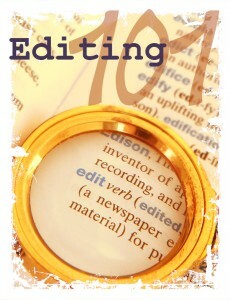 Next, I looked at the Point of View word counts in each chapter. The blue parts of the graph are Tyris, my hero, the red ones are Marlee, my heroine. 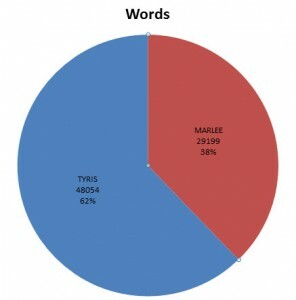 As you can see, in the beginning of the novel, Tyris has way more page time than Marlee. This was a really interesting development (and one I suspected, hence my graphing), so I did an actual graph of the overall page space next. Yep, Tyris gets way more page time. 62% to Marlee's 38%. The people who've read my novel don't feel this is an issue, and I'm inclined to agree with them. In Reckless Rescue, Tyris is in a world that is strange and unfamiliar, and since it is unfamiliar to the readers as well, I use Tyris's eyes to describe it to them. However, I did look through the scenes, and identified two early on scenes that could be just as easily told from Marlee's POV, and changed them over. Hopefully this will give Marlee a little more of a chance to engage with readers early on. Later on in the novel, as Tyris becomes used to his surroundings, their page time evens out. This was a fun exercise (yep, I actually enjoy playing around with graphs, I'm weird), and though it was mostly about numbers, it did help me change a few points in my novel, and help me see it a little more clearly. 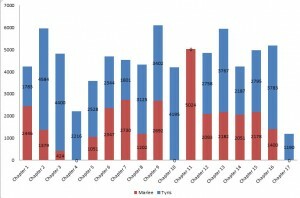 How about you, have you ever created graphs of anything in your novel during the editing process?